“Girls just wanna have fun” — the show’s title — also made it onto those football boot stilettos. 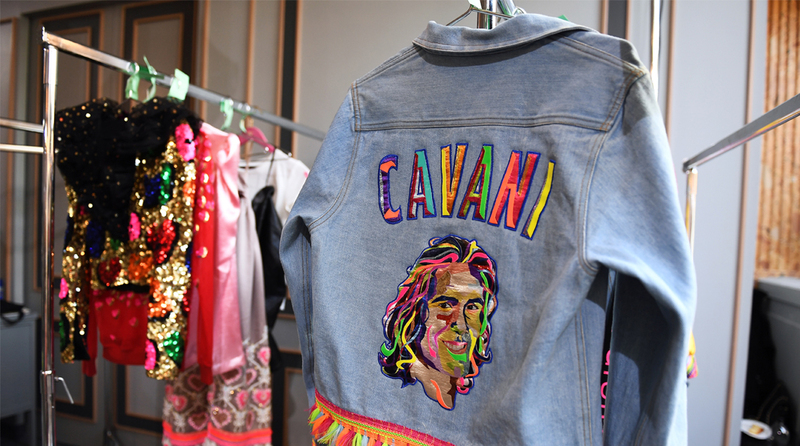 Football’s biggest stars burst onto the Paris fashion runway Thursday with Neymar, Kylian Mbappe and Edinson Cavani popping up on T-shirts and satin bomber jackets by Indian designer Manish Arora. The flamboyant creator has linked up with their club, Paris Saint-Germain, to produce a line of women’s clothes inspired by its stellar trio of strikers, including vertiginous stiletto football boots in a mix of hot pink, lime green and gold aertex. In the most colourful and joyous catwalk show of the week so far, Arora remade the team’s crest with the footballers’ faces surrounded by adoring hearts in Indian Zardozi metal embroidery. A kaleidoscopic portrait of PSG’s dishy Brazilian defender Thiago Silva adorned another top, while Neymar’s featured on the shiny scarlet tongue of Day-glo rainbow trainers. “Life can always be more colourful,” he quipped as he also sent out football-shaped gold chain bags decorated with the players’ faces and names, and jackets with staggering leopard-head shoulder pads. The traffic-stopping outfits came with leopard hand bags “complete with laser eyes”, the ultimate WAG (Wives and girlfriends) swag. Then there was the model in a heart-covered wedding cake gown, her face done up like a wacky Snapchat filter, not to mention the three-tiered cake bags. “The kitsch quota comes good enough to eat,” Arora joked, and it doesn’t take a huge leap of the imagination to see them making it onto WAG credit card bills. The show went down a storm with critics, with the style bible Women’s Wear Daily hailing Arora for “reaching out to a global audience” and nudging his clothes “upmarket a notch, trimming away some of the excess without losing any of its punch”. It is not the first time that PSG has inspired Paris designers. Last year the smart young French brand Koche send out a line of re-imagined silky PSG tops. The official link-up with Arora, however, is part of PSG’s strategy to become a global entertainment industry brand, with a capsule collection drawn from the show due to go into the shops in China and India in February.